I was born on the 9th of May 1961 at Østerbro in Copenhagen. I was welcomed by my parents from Jylland (Jutland) and my two older brothers. We moved shortly after to Store Magleby, near Dragør, Amager. the house functioned as a boarding house, which they also managed. 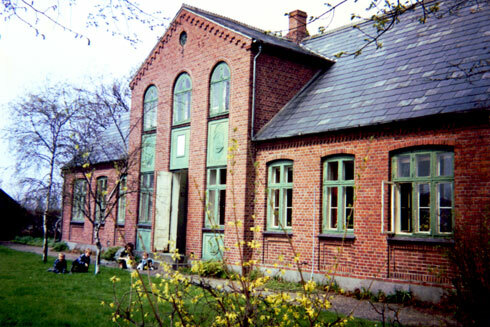 When I was 4 years old, the family moved to Fyn (Funen), just outside Marslev, a small railway junction, where we lived for 5 years. 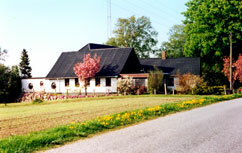 The Mill as the place in Marslev was called. In front, we see the large storehouses in which seeds and grains were dried and at the back left the farmhouse. Then we moved to Rynkeby (the village famous for its apple juice and jam). Here my parents built a small nursery with greenhouses. 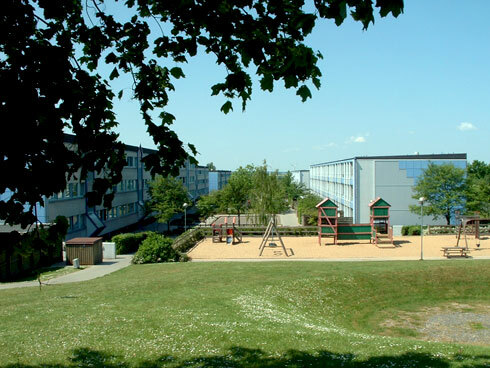 After 10 years in primary school, I had absolutely no idea what I would do, so I went 9 months to Egmont Højskolen (a folk school, kind of private boarding school) in Hou. I moved back to the nursery while I went to Mulernes Legatskole, an upper secondary school (high school). The house in Rynkeby was a ramshackle small house when my parents bought it. Sand on the floor, where I later got my room and loo in the yard. 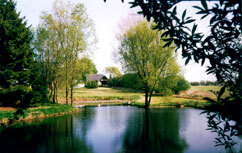 During the years it became a wonderful and beautiful place where I spent many hours at the small lake. In 1983 I went on my first major trip, which was a half year to the United States and Canada. Together with two friends we drove 40,000 kilometers at the North American continent. At the age of 25, I moved to Trige, a small town just north of Aarhus, where I still live. The block of flats in Trige. which I often use the summer. 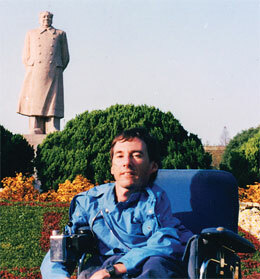 I began to be involved in the disability movement, through Dansk Handicap Forbund DHF (The Danish Association for Disabled) and especially in Muskelsvindfonden (the Danish Muscular Dystrophy Association). I did, among other things, street theater, courses and began to give speeches. I am in front of the great Mao Zedong statue at Fudan University. In 1988 I began to study Chinese language and culture at Aarhus University. This brought me to Shanghai a few years later, where I studied one year at Fudan University. I also had many opportunities to travel around in the huge country. I continued the studies in Denmark for 2-3 more years, but never completed my degree. I became more active in Muskelsvindfonden where I for many years was a member of the supervisory board and the executive committee. And was also vice-chairman for a short period. I have over the years held numerous speeches around the country and sometimes in other countries. The topics have also been diverse. I can mention a few, such as 'to live a life of quality ', 'Chinese cuisine ', ‘daily life with helpers’, ‘voluntary work in an organization', and various travel slide shows. I have in recent years worked with theater. Recent performance has been a solo performance ‘Svinemusklen' (The swine Muscle), a provocative drama about disability, normality, acceptance and respect. Today I live alone in an apartment with a small garden. Enjoy life and love to see and sense what is happening in my neighborhood. Perhaps that is why I love to travel. I love food (also to make it), wine, beer and single malt whisky (Laphroaig, Caol ila, Lagavulin and Oban are among the favorites). I enjoy going to concerts and in the theater. Being together with interesting people (especially my dear friend Gert Riis). A conversation about life's important topics over a glass of wine or a cup of beer. Music, especially from the 60s and 70s (gladly some hard rock). Enjoy the silence in the middle of a forest, to gaze at the wide sea, or to look at the stars in the infinity universe.